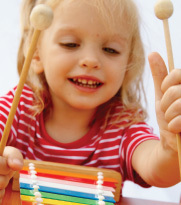 Growing With Music’s independent instructors teach music classes for infants, toddlers and preschoolers that introduce musical concepts and encourage overall childhood development. These highly qualified music teachers determine the appropriate frequency, duration and topics for each class, based on the needs of the group. Through song, dance, and play, the instructors provide age-appropriate activities that focus on both musical and non-musical skills. The general curriculum focuses on a variety of different skill sets. called "Say Hello." We echo the words to sing along! a mouse (Piano) and my monster (Forte). We listened to loud and quiet music and moved accordingly. then we got to play them together, both piano and forte! Contact us to learn more about Growing With Music’s curriculum.